Mouse over a question mark to get information. Displays an alphabetical listing/index of catalog pages. Listed alphabetically by page title. Once on the index, with a click or tap you can optionally view the list by page number. The page numbers relate to our legacy printed catalog. Oldtimers know that a page number is also key to an SOR part number. Click or tap the title to navigate to that section of the page. Click the logo to navigate back the the SOR home page. Specter has made printing our catalog pages simple. Clicking on the printer icon prints everything in the body of any page of our web site formatted to fit standard letter size paper. To shop the SOR website it is not required that you login. When logged in, your items will be saved in your shopping cart. Continue shopping and add items to your cart over a few days, then submit your order when ready. Logging in give you access to change your password and view past invoices. Once registered and logged in, the word "Login" changes to "Welcome Your Name" and "Register" changes to "Logoff". Simply click your name in the top right corner of the screen to gain access. View your info and edit as needed. Click "Logoff" to log out of the system. In order to keep track of items in your cart, you will need to register. Even if you are a current SOR customer, you will need to register for the new system to save your customer information. It's easy to do! Just enter your email address, your first and last name, and your postal zip code. If you are an SOR CLUB MEMBER, you will need to enter your SOR CLUB Customer Membership number in order to guarantee you receive your club discount. Clicking the Shopping cart button navigates to the shopping cart/checkout section of the catalog. There you will be able to edit items in your cart, such as increasing quantities and removing items from your cart. Logging in will navigate you to your shopping cart. Items from a previous shopping session will combine items currently in your cart if any exist. Items from a previous session will temporarily display with a yellow background. Duplicated items temporarily display with a pink background. Check quantities needed of duplicated part numbers. To change quantities enter the new amount and click "Redo Total". To remove an item from your cart, enter zero ("0") for the quantity and click redo total. You can continue shopping by clicking the "continue shopping" button, entering a search query, or picking a category from the context menu in the left panel. You can also start over by clicking the Clear Cart button or expedite your order by clicking the Checkout button. 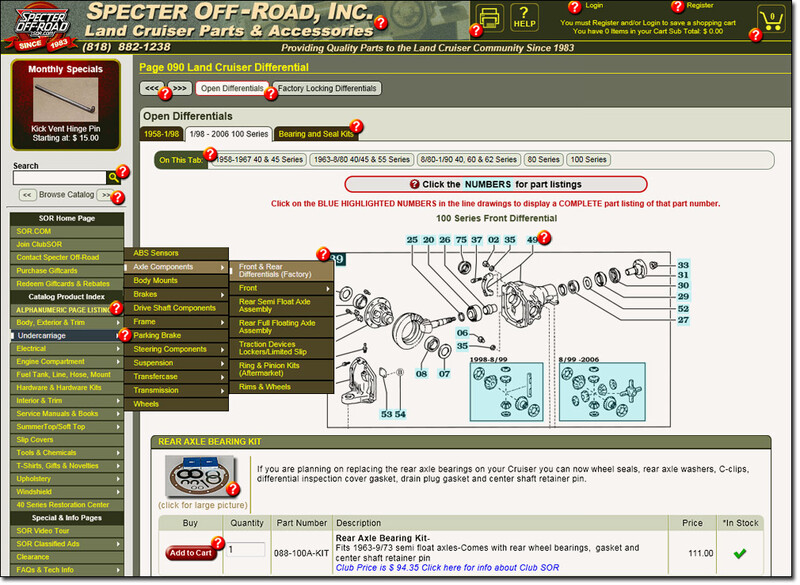 Use the page forward and backward button to browse the Specter Off-Road web site page by page. Click Subpage buttons to quickly navigate to the selection of choice. A white button with red outline signifiy your current page. Use the page forward and backward button to page through the subpages. Page tabs organize each page into more finite sections usually separating models or production periods. On this tab buttons subdivide tab pages by linking to products farther down the page. The context menu on the left side of the web site affords our customers quick access to pages based on category or vehicle system. Mouse over a section; use you mouse to follow the submenus as they appear. Click on the section of interest. Assembly drawings are a convenient way to purchase parts from SOR. They provide a reference point ensuring you purchase all the part required to do the job right. Click on these numbers to navigate to a listing of that numbered part. Purchase your part from that listing based on the production date and model of your Land Cruiser. You can purchase assemblies by clicking on any black square with white numbers in the upper left corner of the outlined assembly. Numbers with line leaders to parts are individual parts. Bracketed parts in drawings with single numbers signify part numbers of subassemblies. Product images on the SOR web site can be magnified for a better view. The mouse cursor will change to a magnifying glass on images that can be zoomed. Multiple images can be zoomed for comparison. Click to zoom in product images. Click multiple images if needed. Click and hold down the mouse button to drag the image to a new location for comparison. Click the image again to return to normal view. Click the "Add to Cart" button to add an item to your shopping cart. Once clicked, the button displays as "In Cart" with a green dot and the quantity field is no longer editable. A shopping cart quick view will temporarily appear at the top of the page to confirm the addition. Either click the "X" to close it or let it fade away on its own. In some cases you will want more than one of an item. Change the number in the quantity field before clicking the "add to cart button", that quantity will add to your cart. You can always change quantities of an item in your shopping cart. Go to your shopping cart to remove unwanted items. Click on these numbers to navigate to a complete listing of that part. Purchase your part from that listing based on the production date and model of your Land Cruiser. � Copyright 1996 - , Specter Off-Road, Inc. All rights reserved.